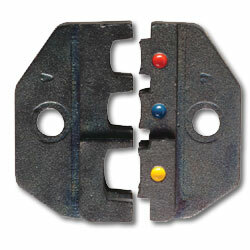 Kwik Cycle 9" Die Set is used for crimping 22-10 AWG fully insulated slide on style connectors. AMP Ultrafast style. Color coded nests for easy identification. To be inserted into Kwik Cycle 9" Crimper (45504).